After falling off the wagon, and gaining 10 lbs by going on a carb binge, I’m back to eating healthy and in charge of my weight. Why did I do it? Eat all the bread, pizza, candy, snack foods and beer I could find? I binged for three months, and gained back the 10 pounds I had lost last time I was following a KETO diet. Why? Not sure. I felt like crap doing it, knew it was unhealthy, but couldn’t stop myself. I guess it felt good to indulge in eating whatever I wanted…but there is a hefty price to pay. I’m on week 2 and am hopefully over feeling very weak from the lack of carbs. I’d like to share a recipe from the ruled.me cookbook. This one is really yummy, and you would never know you’re dieting when eating this meal. Add them to a mixing bowl along with the ground chicken. Chop 2 tbsp. cilantro and add to the bowl. Season with spices, then juice 1/2 lime into the chicken meatball mixture and add the zest. Looking for a grater and zester all in one? This one works great (HERE). Add 2 tbsp. almond flour and flaxseed meal, then mix everything together well. Add the cheese to the mixture. Roll out the meatballs as uniform as you can, and bake for 15-18 minutes or until cooked through. You should have 20 meatballs in total. I love using my white casserole baking dish with handles (HERE).for this recipe. It comes in multiple sizes and looks fantastic with the rest of my white serving pieces. I have a couple of sizes already and use them often, especially for entertaining. My WOLF Gourmet Countertop Oven (HERE) is a dream. I’ve had it for about 4 months now and love it. It cooks really well and evenly. I use the convection feature quite a bit to cut down on cooking time and it works great. Doesn’t dry out the food like my last countertop oven did. My only complaint is the amount of time it takes to toast bread, but the results are worth the wait. 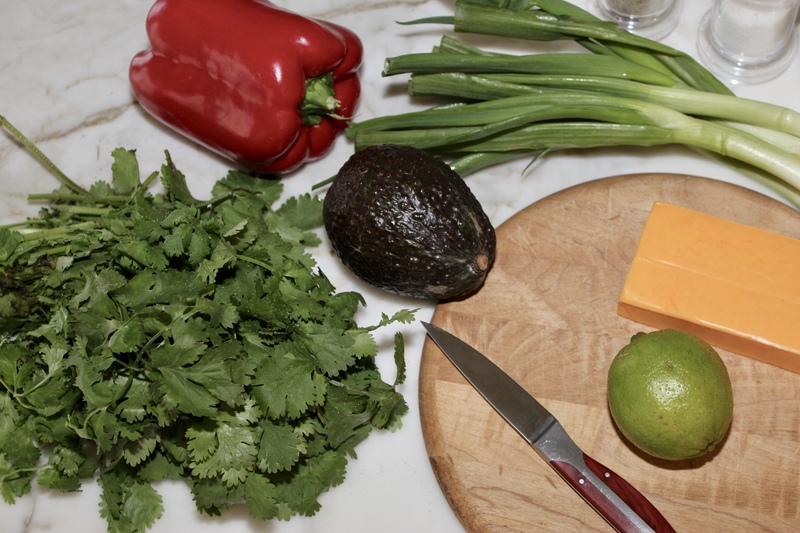 To make the guacamole, mash together avocado, juice from 1/2 lime, garlic powder, salt, pepper and more cilantro. I always add more cilantro than a recipe calls, because I love the taste. The 20 meatballs yields 4 servings. Add guacamole to the meatballs and you have a delicious meal. Bon Apetit Mes Amis! Also, check out my chicken parmesan KETO recipe (HERE). and learn more about the KETO diet.